It's the beginning of February, the super bowl is happily behind us and the red and pink lovey dovey stuff has flooded every store! Well, I'm not going to lie, I love it because it's not only about celebrating my love for my significant other but also my love for friends and family- in Spanish Valentine's Day is "el dia del amor y la amistad" (translation: day of love and friendship). 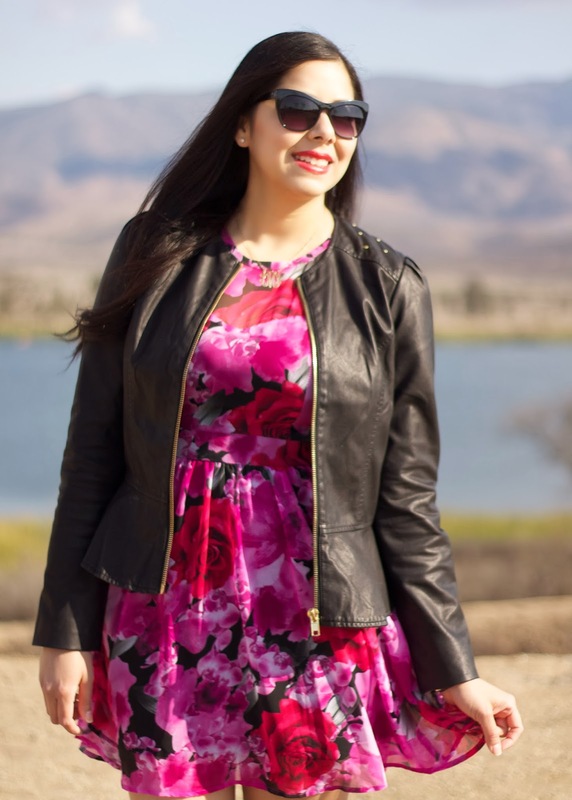 This rose dress oozed Valentine's, but instead of pairing it with pumps I decided to give it an edgy twist with this studded jacket and booties. 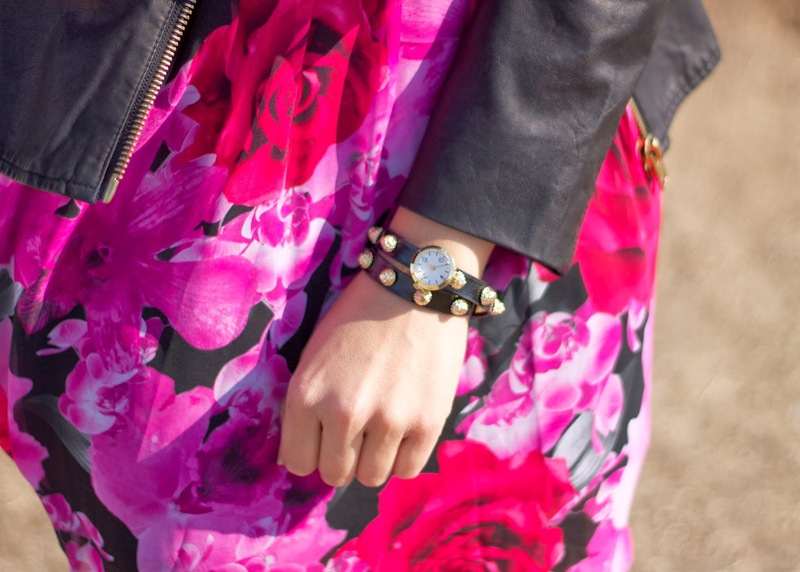 The pairing allows it to be worn to either date night or drink with the gals! 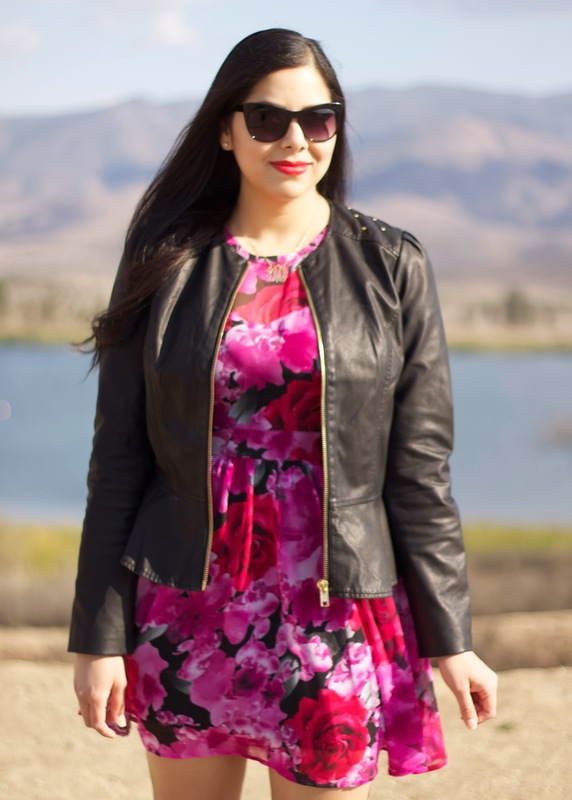 About the Outfit: Forever 21 Dress (similar / similar), Forever 21 Jacket (similar), JustFab LUXE booties, Forever 21 sunnies, Tanya Kara Jewelry wrap bracelet c/o. Pictures by Laura Neuzeth (check out her blog here). Yay! The pictures came out fantastic! :D I'm so glad with how they came out. We'll have to go back to that place to take more pictures in the future. It hits a perfect balance of soft and hard. You look beautiful! The outfit is gorgeous and the background looks amazing!!! :D LOVE! I love that you and Laura did this collaboration! You look lovely and that dress is adorable!